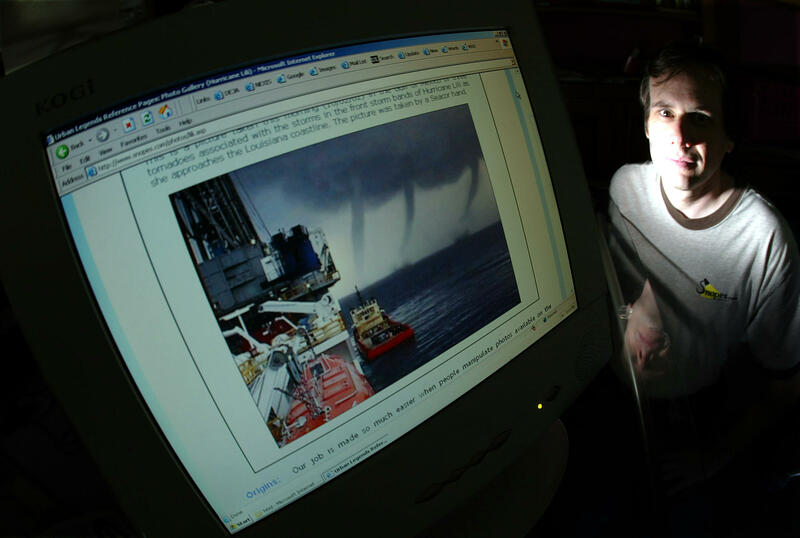 David Mikkelson, founder of Snopes, sits next to a doctored storm photo in 2004. Snopes debunked that image — and has uncovered many other hoaxes. But the future of one of the nation's first digital fact-checking initiatives is currently in doubt. What isn't a hoax is that the future of Snopes, one of the nation's first digital fact-checking initiatives, is in doubt. Mikkelson tells NPR that he's been cut off from all revenues and has launched online crowdfunding appeals; he says he's raised more than $600,000 in the first days of his efforts. Snopes does not have a large newsroom. Its creation was sparked by the fascination David and his wife Barbara took in responding to urban legends that whipped around the ether in the early days of widespread email use. The name Snopes was taken from a family in several novels of William Faulkner. Now operating with a team of just 13 editorial staffers (including video and graphics) Snopes weighs in on matters large and small, covering subjects including politics, pop culture, tech, health. While it's not a household name, Snopes drew 12.4 million unique American users in June according to Quantcast, and another 3.7 million around the world. Snopes has endured because it has proved reliable. And the site has had a significant influence on how journalism is practiced in the digital era. "Snopes laid the foundation for online fact-checking," says Bill Adair, the founder of PolitiFact, a Pulitzer-prize winning offshoot of the Tampa Bay Times. "The site's early work debunking urban myths showed there was a substantial digital audience that wanted accurate information." While many newspapers and television stations were scrutinizing the veracity of campaign ads, many claims made more broadly often passed without challenge. Snopes has since been joined by many other players; Factcheck.org, affiliated with the University of Pennsylvania's Annenberg Public Policy Center, was established in 2003, and PolitiFact started in the early part of the 2008 presidential cycle. Major news organizations including NPR, the New York Times and the Washington Post now routinely fact-check statements made by major public figures. Among its more recent posts, Snopes has unraveled claims that Pope Francis endorsed President Trump's campaign, that the Sandy Hook elementary school massacre was staged, and that the star of a Nickelodeon sitcom for kids was arrested for prostitution. All were false. Facebook has turned to Snopes as one of the five U.S.-based fact-checking it relies upon to help stave off the spread of hoax accounts, often called "fake news." (Trump has adopted and co-opted the term to encompass mainstream news reports he doesn't like or that are critical of his administration.) In a project still in the testing phase, Facebook users can flag posts shared on the social media site as questionable; if enough users do so it is sent to the fact-checking outfits, which can share related posts that evaluate the veracity of its claims. If something has been debunked, a badge saying so is attached to the post to caution Facebook users. But Mikkelson says Snopes' very existence is in question. After he and his former wife, Barbara Mikkelson, divorced, she sold her 50 percent stake in Snopes and its parent company to five officers of Proper Media — as individuals. Proper Media is contending that it corporately owns half of Snopes and wants a judge to acknowledge that. The company alleges David Mikkelson unfairly enticed a former Proper Media official to work for him, and in so doing secured that official's 6.7 percent voting stake, once more giving him effective voting control over Snopes. And it alleges Mikkelson inflicted "substantial economic loss" on Proper Media. Mikkelson tells NPR he severed that contract for cause, and was entitled to do so. Moreover, he argues that Proper Media as a corporation has no claim over Snopes' parent company, only the five individuals. "The person in question, I did not lure or hire him away or entice him to leave Proper Media," Mikkelson tells NPR. "They fired him immediately after I told them to their faces how valuable he was." Will Snopes stick around in its current form? Rate that "unproven." OK, here is a fact that we know. Bigfoot was not found dead on a lake shore in New Mexico this summer. If you thought for a moment this story could be true there is a place on the Internet that you can go for a quick answer - right, David Folkenflik? DAVID FOLKENFLIK, BYLINE: You bet. You can go to snopes.com and find out about that question and a lot more - politics, tech, all kinds of stories that pop up. MCEVERS: Questions like, did NASA actually say we are going to have 15 straight days of darkness this fall? FOLKENFLIK: We sure aren't. That was a crazy rumor from 2015 that got new life this summer. There was an article - let's put those in air quotes - that was posted by a fake news site. MCEVERS: OK, what about this claim? Snopes itself is fighting for its existence. MCEVERS: OK. NPR media correspondent David Folkenflik, tell us about it. FOLKENFLIK: Well, right now there's a battle for control of Snopes between its founder, David Mikkelson - his co-founder and former wife, Barbara, sold her 50 percent stake in the company to five officers in this outfit called Proper Media. And now there's a tussle over control of the site. David Mikkelson, the founder, has put out a call for crowdfunding his legal defense. This is going to be playing out in court later this summer. He's raised about $600,000 so far. And there's a real question as to who's going to really control this thing as it moves forward. MCEVERS: And Snopes isn't like a household name, but, you know, more than 12 million unique American readers went to the site last month, according to the tracking company Quantcast. Why do you think it's so important to some people? FOLKENFLIK: You know, it started out - Mikkelson created it really to combat urban myths writ large, the idea that people were circulating kind of false ideas that somehow had caught hold in the ether out there. And he wanted there to be a clearinghouse for this stuff. It really served as an inspiration for places like factcheck.org, PolitiFact, the work that, you know, people here at NPR, The New York Times, The Washington Post and other major news organizations do to sort of vet and fact-check claims that are made in the public realm and by other news organizations. And it also gave us in certain ways an ethos for doing it. That is, that it cited how it arrived at its conclusions, included hyperlinks so people could go in to look at original documentation for themselves. I think it set the tone for a lot of fact-checking that followed even in major journalistic outfits. And I think it created in some ways at least something of a hope of an antidote for what we've seen for the swirling concerns over hoax news that we've seen particularly in the last presidential campaign. MCEVERS: And Facebook is working with Snopes. What's that look like? FOLKENFLIK: Well, you know, some months ago they started on what's still kind of a beta effort with five fact-checking outfits, Snopes being among them, that when users come across content that they see online and they flag it - they question whether or not it's valid or true - if enough people do that, Facebook will automatically kick that over to fact-checking organizations. And what folks at Snopes can do is they can then include or send Facebook to links to stories they've done or posts they've made reviewing, debunking or affirming the claims made in those posts. So these outfits are trying to serve in some ways to solidify Facebook as a credible place to get information. After all, there'd been a big backlash against Facebook for just that question. MCEVERS: Do you use Snopes? FOLKENFLIK: You know, I used to go to the site directly. Now I think I encounter it the way most people do, through other people's links either in news articles online or through social media. I've found that they not only rely on major news organizations to buttress the evidence they're trying to show. They've used my own work. And I think they're really trying to show people that they're relying on credible information. And it - you know, it's gratifying, but I think it also gives one some faith in what they're trying to do there. MCEVERS: We'll keep an eye on what's happening with the company. NPR's media correspondent David Folkenflik in New York, thanks.